After the Dallas programs, Amma and the tour group travelled almost 1400km north and visited the city of Cedar Rapids, Iowa for the first time. Along the way the group stopped with Amma under the shade of a grove of trees just besides a small lake. It was a truly idyllic setting to sit and eat lunch with Amma, sing bhajans and listen to her satsang. 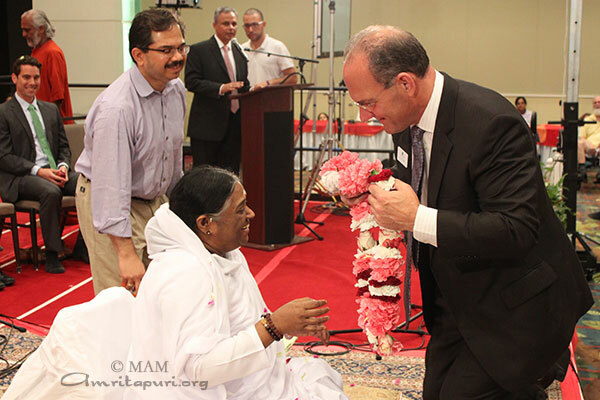 Amma held two days of programs at the brand new Cedar Rapids Convention Complex. The two days of programs were the very first to be held in the large exhibit hall. To mark the occasion and officially welcome Amma to Iowa both Mayor Ron Corbett and Member of the County Board of Supervisors, Ben Rodgers, were on the dais to garland Amma and addressed the crowd. After two days of satsang, bhajans and darshan, Amma finished her final program early in the morning and went to visit the new Iowa Ashram for the first time. Nestled among corn fields, fruit trees, vegetable and flower gardens, under vibrant blue skies and the auspicious gaze of a small herd of cows, the center sits on 12 beautiful acres of land. Amma sat outside with local devotees and watched the sunrise over the majestic horizon and shared a few more precious moments with them before traveling on to Toronto, Canada for the next stop on the tour. After finishing five days of programs in Albuquerque, New Mexico, Amma continued to the next programs in Dallas, Texas. Along the way Amma stopped with the tour group at sunset besides a lake. Everyone sat with Amma just besides a large prairie dog colony. As the sun began to set and the prairie dogs all returned to their burrows for the night, Amma began to sing bhajans with everyone. On the horizon a huge nearly full moon rose over the lake just in front of Amma. Amma sang Kodanukotti, Ananthamayi Padarunnen and Mritunjaya with her gaze towards the moon and continuously raising her arms skywards. 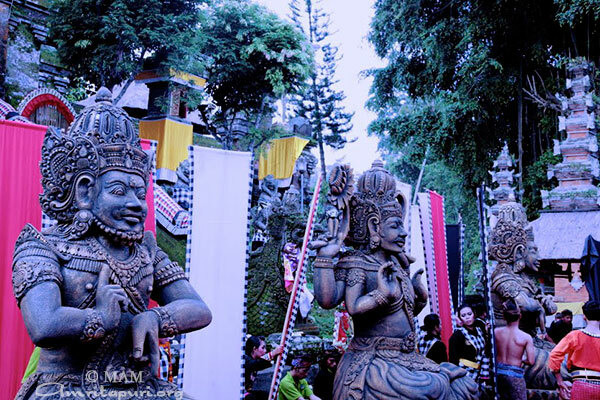 Everyone there felt as if they were eavesdropping on a intimate exchange between Amma and the moon. 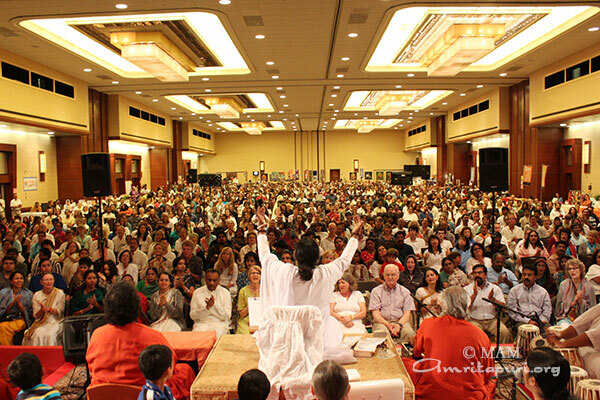 Over the next two days Amma held two public programs in at the Hyatt Regency inside the DFW International airport. Being a weekend, the hall was filled to capacity on both days by people coming to enjoy Amma’s satsang, bhajans and to receive her darshan. The final night’s program stretched into the early next morning. As soon as Amma’s darshan finished, Amma and the group travelled on to Cedar Rapids, Iowa. From Saturday 25th May to 2nd June, 208 cataract surgeries were performed in Thika hospital on the outskirts of Nairobi for poor people. 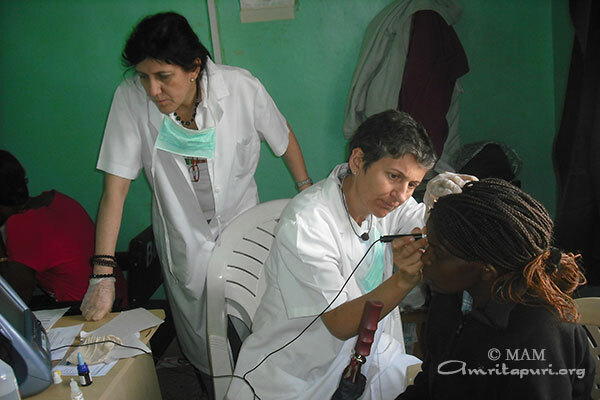 The project was gestated, as a direct request from Amma and it was MA Center Kenya, who invited a team of Spanish doctors to do the surgeries. Nagesh Katuri, representing the MA Center, Kenya, host the program along with Lions Club Club of Greater Nairobi and Lions Club of Chania Falls. 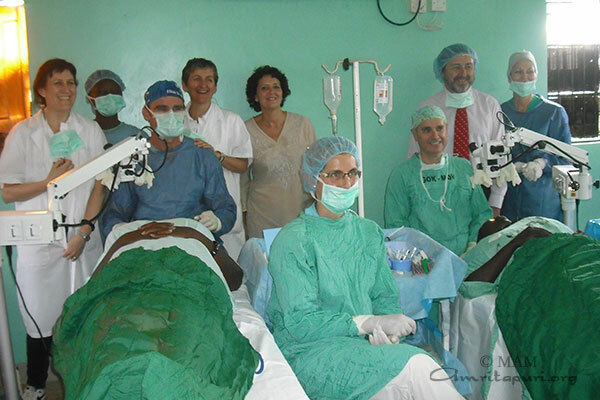 Two ophthalmologists Dr Jaime Javaloy and Dr Tomas Moya, two nurses and two optometrists from Spain, and a surgeon constitute the medical team. There was a lot of local support, to translate, to accompany, to take notes, move patients, and get whatever was needed urgently. Governor of Kaimbu County graced the occasion of inauguration as the Chief Guest and the Special Guest of Honor was the Spanish Ambassador to Kenya Mr Javier Herrera. Most of the patients had one eye operated, and only a few cases were operated in both eyes. A young man who came with a foreign body embedded in the cornea, and the case of a 19 years old with an invading corneal epithelial growth were also treated. 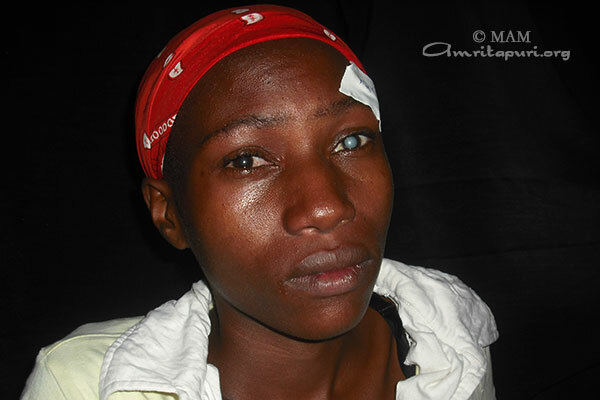 There were 4 young with traumatic cataract who were also intervened. 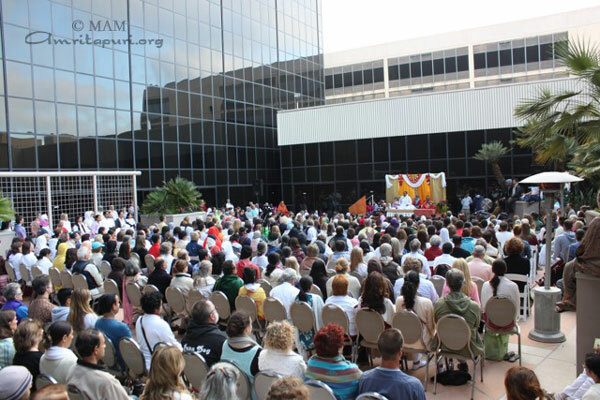 After the final program ended in Los Angeles at 11am, Amma and the tour group travelled the 1300km by road across the deserts of the Southwest to Albuquerque, New Mexico. Despite the long journey, Amma still took the time to stop with the tour group in a park for a picnic dinner along they way. The intense desert sun slowly set as Amma sat with everyone under the shade of a tree, giving satsang, singing bhajans and serving everyone a prasad dinner. When it was time for the journey to continue, as Amma stood up and walked back to her vehicle she looked up and noticed the first stars shining in the dusk of the clear desert night sky. She couldn’t resist the beautiful scene and stopped before entering her vehicle and raised her arms skyward and sang Shristiyum Niye. It was a truly beautiful scene with creator and creation. The tour group finally arrived very early in the morning to New Mexico after the long journey, just in time for Amma’s first program. 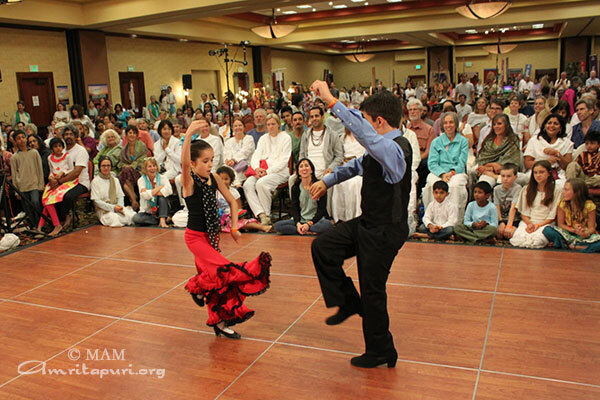 The dry desert heat followed Amma to Albuquerque as temperatures during the programs soared, but as has become a tradition, whenever Amma comes to New Mexico, she also bring the rain. The first day upon Amma arriving a sudden thunderstorm brought much needed rain to the parched area. 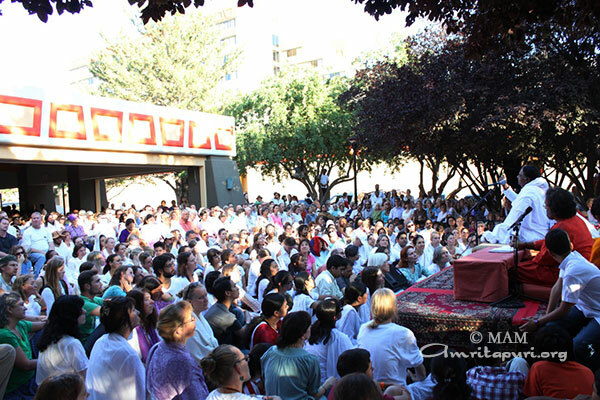 Over the next 5 days Amma held 2 days of public programs and a 3 day retreat. Each day Amma led bhajans, gave satsang and embraced all that came for her darshan. Not once, not twice, but three different times at the end an evening program Amma surprised everyone by spontaneously singing and dancing to the delight of all those that stayed up into the early morning. 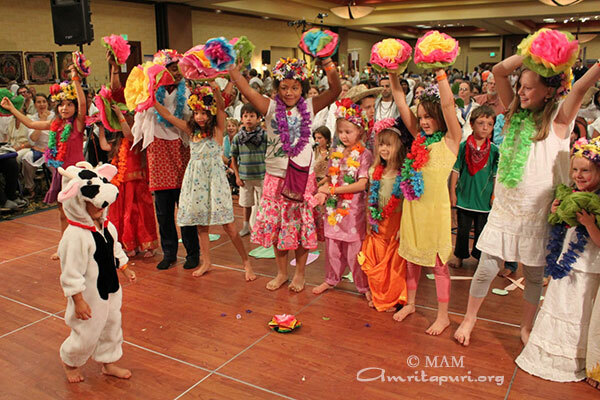 During the second night of the retreat local children performed several dances and musical dramas for Amma during darshan. The final evening program stretched into the next morning. By the time Amma finally left the stage the desert sun was shining brightly and the tour caravan left for Dallas, Texas. 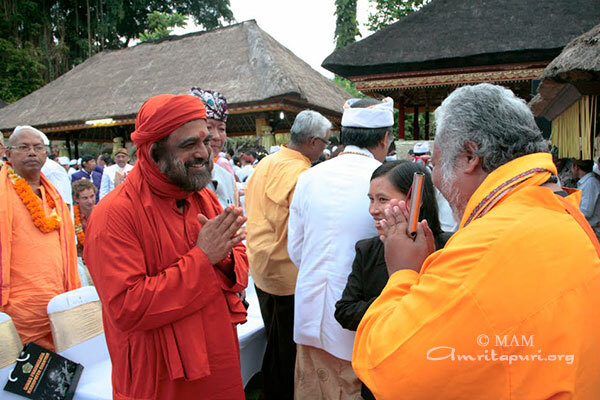 Swami Purnamritananda participated in the World Hindu Summit of 2013 in Bali, Indonesia. 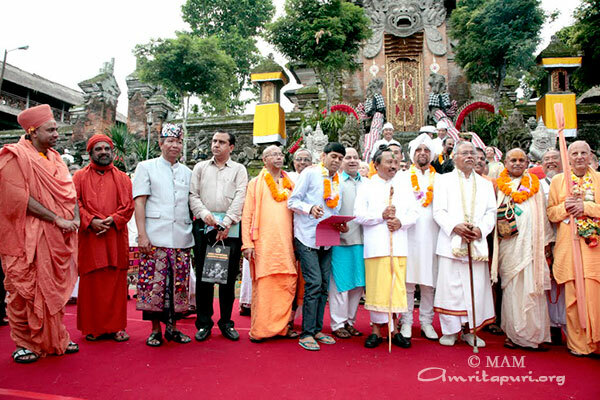 The agenda of the World Hindu Summit of 2013 is to establish the World Hindu Parisad or Assembly, developing its constitution, structure, office bearers, etc. 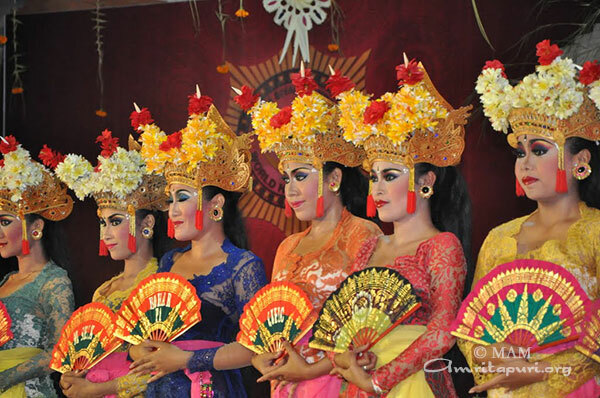 The highlight of the opening ceremony was a very grand performance put up by the Balinese, representing the story of how spiritual harmony amongst the various religions was achieved in Bali by the power of Trimurti. 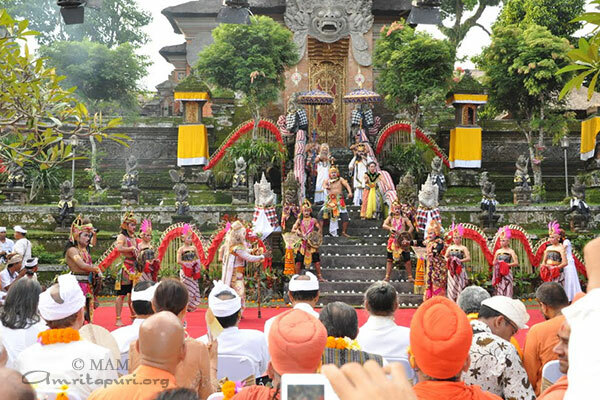 Among the important guests that came to welcome were the Head of the Indonesian Hindu Parisad, Dr I Gusti Ngurah Sudiana; the Head of the Indonesian Ashram Association, Prabu Adi Purusa; the Head of the Bali Ashram Association, Acarya Yogananda; the Chairman of the World Hindu Summit, Professor Made Bhakta; and the Chairman of the World Hindu Summit Committee, Dr. Made Sad Guna. 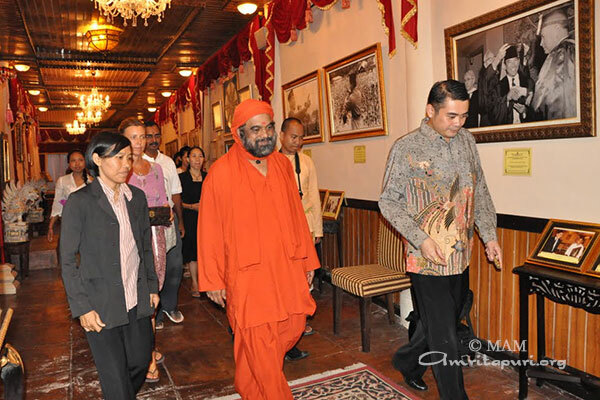 Later Swami had a meeting with Dr. Arya Wedakarna – Director of Sukarno Centre, Chancellor of Mahendradatta University. 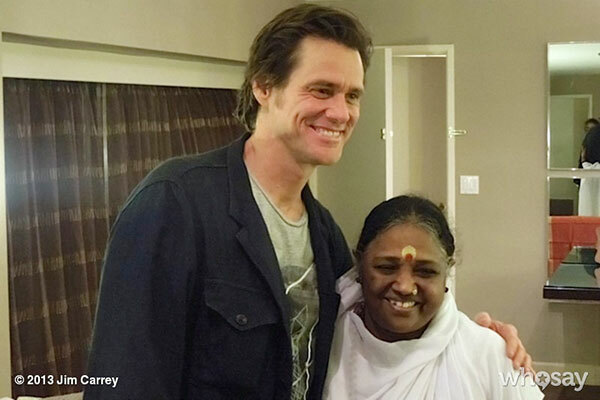 Amma held 2 days of a public programs and a 3 day retreat at the LAX Hilton. During the first evening program several local officials including: Steven Napolitano, Senior Deputy of Los Angeles County Supervisor Don Knabe and Melissa Uribe, Field Representative of California State Assembly member Al Muratsuchi felicitated Amma on the inauguration of the MA Center Los Angeles. One of the highlights of Amma’s retreats are the lively question and answer sessions that take place on the second night of the retreat. During this retreat a devotee from Mexico very innocently took the microphone and asked Amma in her native spanish, “Cuando vienes a Mexico?” asking Amma when she will come to Mexico. Without any hesitation or waiting for someone to translate the question into English or Malayalam, Amma immediately replied, “Mañana!” or ‘tomorrow” to the delight of everyone present. To the relief of everyone at the retreat, Amma did not leave and go to Mexico the following day, but stayed in Los Angeles to complete the 5 days of programs there. 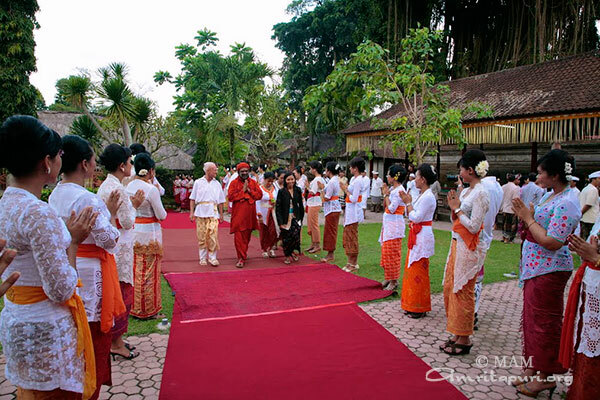 The final Devi Bhava program began at 7pm and did not finish until 11am the following day.